Then we removed all the courses with less than 20 reviews (the low threshold helps smaller providers to compete on quality) and courses for which we had doubts whether they would be offered again. 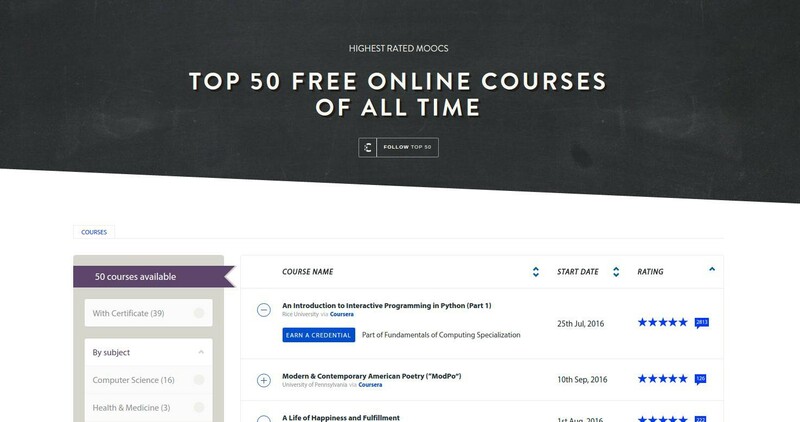 If a course has multiple parts, we only included the first part in the Top 50. The course, lecture, and examples build on each other to teach the fundamentals of programming in general (logic, loops, functions, objects, classes) and also deals with advanced topics including multi-threading, events, and signals. Throughout the course, students create meaningful and rewarding expressive digital “instruments” that make sound and music in direct response to program logic. In this project-centered course* you will build a modern computer system, from the ground up. We’ll divide this fascinating journey into six hands-on projects that will take you from constructing elementary logic gates all the way through creating a fully functioning general purpose computer. In the process, you will learn — in the most direct and constructive way — how computers work, and how they are designed. In this course, you will learn the inner workings of cryptographic systems and how to correctly use them in real-world applications. Learn how to program all the major systems of a robotic car from the leader of Google and Stanford’s autonomous driving teams. This class will teach you basic methods in Artificial Intelligence, including: probabilistic inference, planning, etc. This is a course about dementia looking at a broad range of topics including, basic brain anatomy, pathology, dementia research, risk factors, symptoms, diagnosis, medical management, living with dementia, progression and staging, palliation, behaviors and therapeutic approaches. We live in a complex world with diverse people, firms, and governments whose behaviors aggregate to produce novel, unexpected phenomena. We see political uprisings, market crashes, and a never-ending array of social trends. How do we make sense of it? Models. This course is an introduction to learning and applying the principles required to solve engineering mechanics problems. Concepts will be applied in this course from previous courses you have taken in basic math and physics. The course addresses the modeling and analysis of static equilibrium problems with an emphasis on real-world engineering applications and problem-solving. Are you planning to visit, or work or study in the Netherlands soon? This free online course is perfect if you have little or no prior knowledge of Dutch but would like to master the fundamentals in order to survive life in the Low Countries. This introductory Chinese language course will emphasize basic language skills for everyday life in Mandarin-speaking countries.